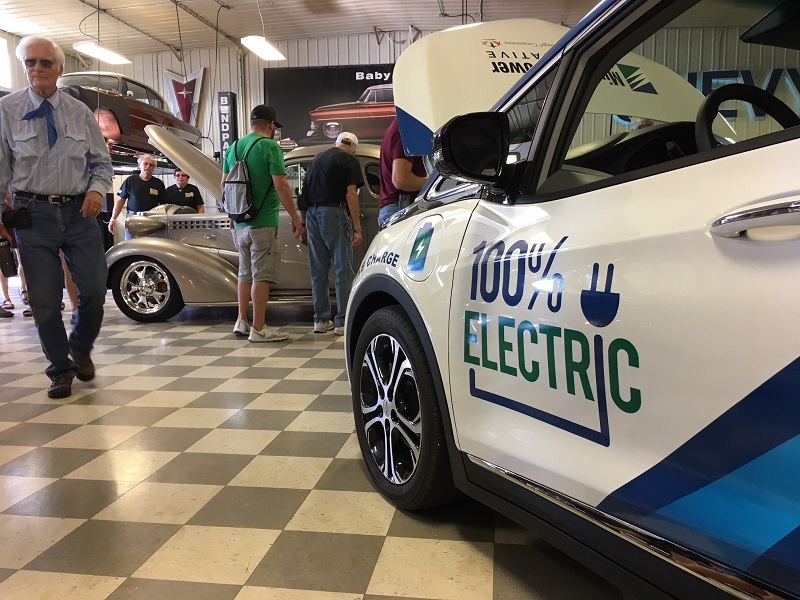 The Minnkota EV and I have had a lot of fun over National Drive Electric Week, traveling to events and meetings in Bemidji, Mahnomen and Fargo. 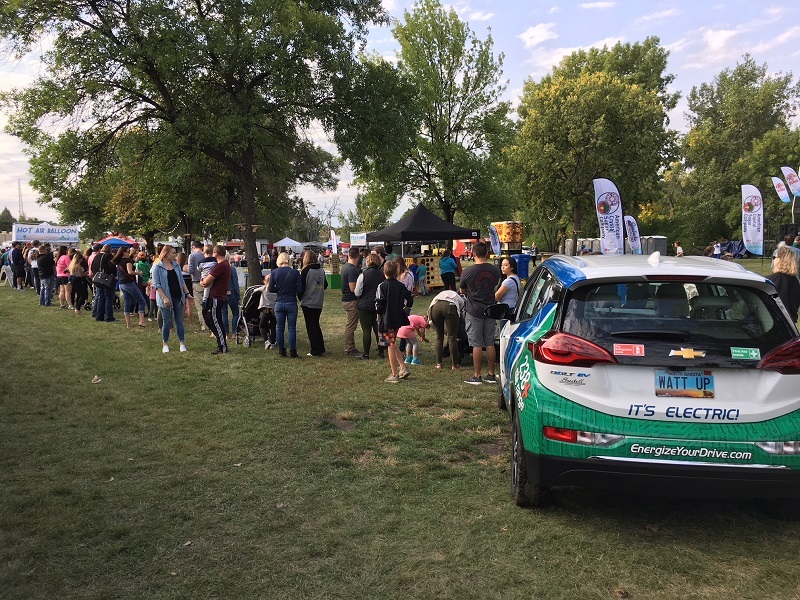 But this weekend, we brought the excitement back to Grand Forks with two community events that drew hundreds of people of all ages and interests – the Greenway Takeover Festival on Friday and the Rydell Benefit Car & Bike Show on Sunday. Both were amazing opportunities to teach people about electric vehicles. The Greenway Takeover Festival is a four-day community event that uses the beautiful Red River Greenway as a setting for all-day music acts, lawn games, food trucks, group exercise, local sponsor booths and much more. When I arrived with the Bolt just before the gates opened to the crowd, I was swarmed with questions from the festival's organizers. It was a fun way to get primed for a day of community engagement! I spoke with dozens of people over the next several hours, some of whom had never experienced an EV, and some who were already thinking about one as their next vehicle. The kids were some of our best question-askers, drawn in by the brightly-colored EnergizeYourDrive.com sunglasses, but then intrigued by the car that had a plug-in port instead of a gas cap. What in the world was this science fiction?! 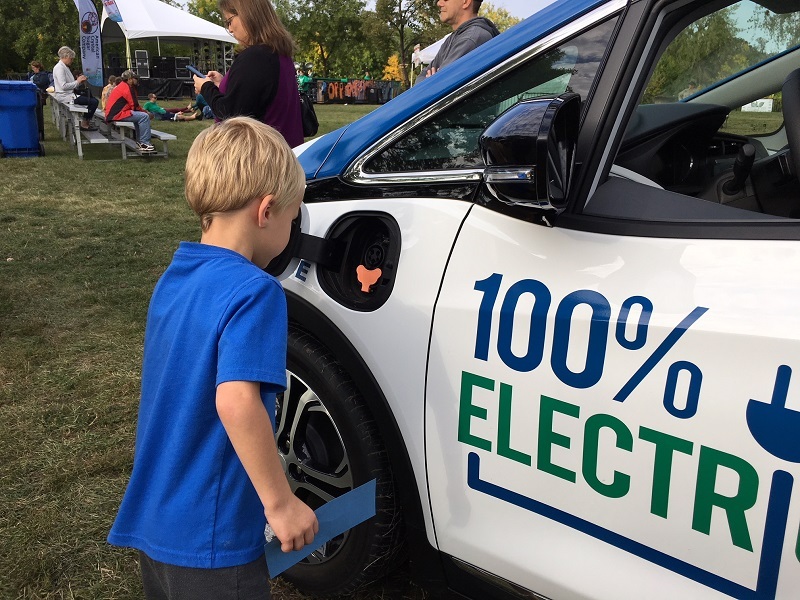 The name of the game is starting EV education young, and this family festival was a great venue to do just that. Do I really even need a caption for this one? I think we have a Minnkota model on our hands. The festival really brought in the droves later in the afternoon as people started lining up for hot air balloon rides. Yes – hot air balloon rides. Talk about next-level transportation, right? The line stretched all the way back to the entrance, right where I had parked the Bolt, so I had the chance to chat with a few people as they waited. From that moment on, the venue was packed as people flooded in for the headliner of the night, the Dirty Dozen Brass Band. Electric vehicles and a funky Louisiana jazz ensemble? Not a bad way to spend a Friday night. A good way to see if an EV is a good fit for you is taking a seat and checking out the features. I think I had these ladies feeling good about electric. Sunday brought an entirely new demographic as I rolled into the Rydell Benefit Car & Bike Show. The proceeds of this annual event go to a cause chosen by the employees of Rydell Cars. This year the recipient was Grand Forks Veterans Memorial Park. With nearly 400 cars registered and hundreds of people walking through the dealership's buildings and lots, the park will be seeing some pretty substantial support. The car show organizers set me up in what they refer to as the "Toy Shop," where they place their rarest and most classic models of cars. The Chevy Bolt certainly stood out, with its short body and modern graphic wrap. But in this case, standing out was exactly what we wanted. A huge thank you to Wes Rydell (far left) and his team for inviting us to take part in this year's Rydell Benefit Car & Bike Show. I won't lie – I was nervous about this event. The car show brings in gear heads from around the region who really know their stuff when it comes to cars. Would I be able to hold my own among the leather vests and tattoos? I think I nailed it! Everyone had incredibly respectful questions about this new automobile technology. Some were certainly cynical about the future of EVs – gas was the only way for them – but most wanted to know all of the ins and outs of the battery warranty, the different charging levels, and even the frame construction. They looked at the car from an entirely different angle. They wanted specs on the motor, the torque and the battery cooling system. Luckily, I've done my research, and was able to hand over all the data they needed. 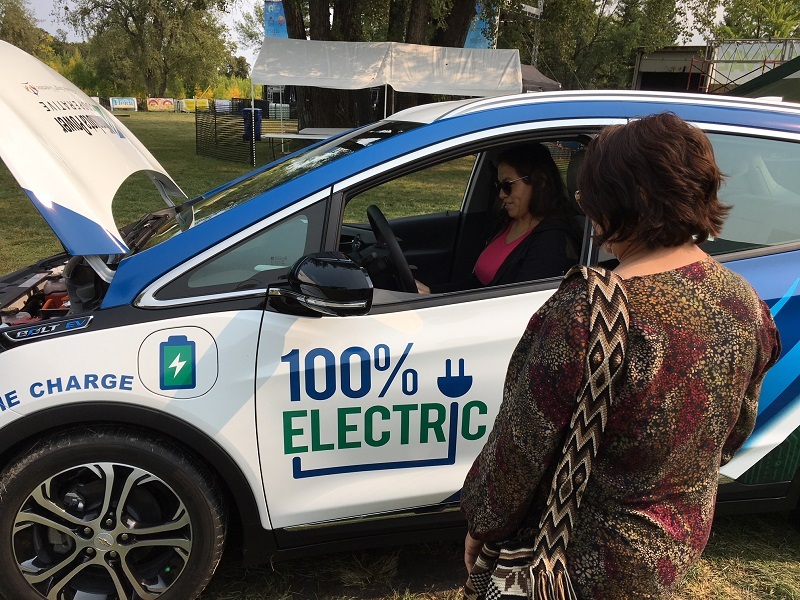 I spoke to an Elvis impersonator for 10 minutes about the need for public charging infrastructure and a handful of veterans about how the auto industry has evolved over the last 50 years. The show draws hundreds of classic car enthusiasts to Grand Forks every year. Last year, the benefit raised more than $100,000 for Grand Forks' new community skate park. Toward the end of the afternoon, I had a nice conversation with an older gentleman who thanked me and simply said, "I really hope they flourish," before making his way to the next car. And that, my friends, is why I love what I do. 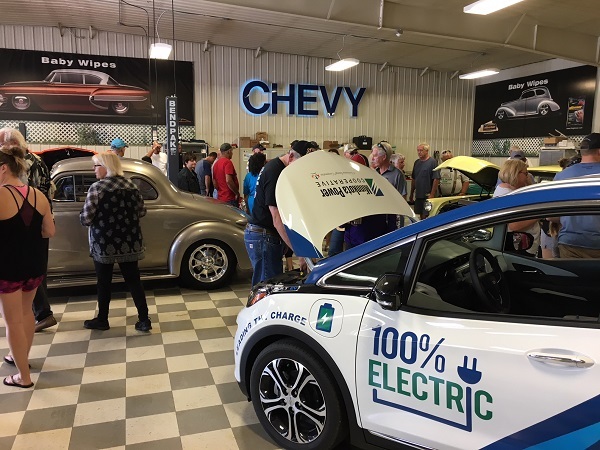 Thanks for celebrating National Drive Electric Week with us!